Hamas expresses support for terrorist who carried out ramming attack in Gush Etzion, promises that more is coming. 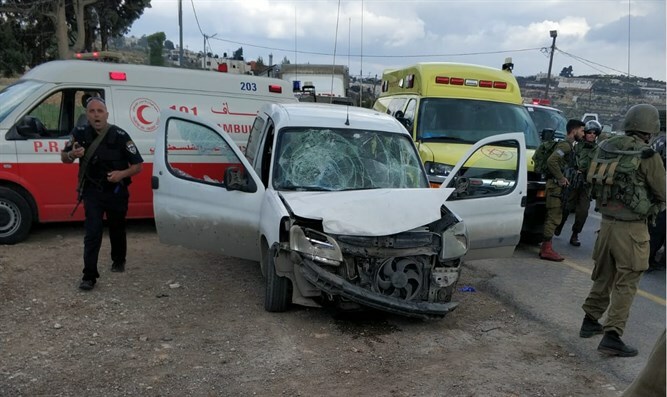 The Hamas terrorist organization on Monday expressed support for the terrorist who carried out the ramming attack in Gush Etzion, in which three soldiers were injured. Hamas called the attack "heroic action" and described terrorist Ramzi Abu al-Yabas, who carried out the attack and was shot and killed by Israeli security forces, as a "hero". Hamas also stressed that "the resistance is the path chosen by the Palestinian people and it will continue in this way despite Israeli activity." The organization threatened that the attack was not the last one and said that more attacks were planned in the near future as part of the resistance against Israel. The attack occurred on Highway 60 in Gush Etzion, south of Jerusalem, at around 12:15 p.m. Monday. The three soldiers were involved in engineering work on the road when they were hit by a vehicle driven by the terrorist, who fled the scene immediately after the attack before being shot and killed.